Add a Bookmark feature doesnot work. James, what happens when you click in the Bookmarks Menu > "Bookmark This Page…"? Do you get an error message? Just tried it with new update and it now works. the latest update. i was happening with the last two updates. Thanks for helping to keep my PPC useful. HOWEVER: I'd been running 24.4 since it was released, but updated to 24.6 today. When I started 24.6 it brought up bookmarks that had been save with Firefox on this hard drive 3 years ago. It seems that Firefox starts as 24.6. Is this standard? Now, I can't find all the bookmarks I have been saving for the last year or so on tenfourfox versions, most recently 24.4. Please direct me as to how to recover those bookmarks. Jim, to be honest, I have not even a clue how this could have happened. TenFourFox and Firefox do use the same user profiles (which contain your settings and bookmarks) simply because TenFourFox is Firefox in this respect. If the user profile (or, more precisely, the places.sqlite database) has become corrupted, TenFourFox might have restored the bookmarks from the last automatic backup. But this backup shouldn't be three years old. The only advice I can give is to or look at ~Library/Application Support/Firefox/Profiles and see if there is more than one profile. If so, please report back, and I'll try to help you set TenFourFox to use the correct profile again, and we'll see if this contains your bookmarks. Otherwise, you'd have to restore your bookmarks from a recent backup, I'm afraid. Firefox and in doing so it pulled my bookmarks from back when. I'm not too savvy with library files, but I found some. that the bookmarks that were showing were the historic Firefox bkmks. I haven't tried to open them. I don't want to risk messing something up. upgrade this morning to .6. Okay, so you only have one profile. TenFourFox itself does not start as Firefox. If it said "Firefox" in the application menu (to the right of the Apple menu on top of your screen) you indeed started Firefox (whichever version), which then probably corrupted your profile. All the "bookmarks. *" files are legacy or backup files. The "real" bookmarks are in places.sqlite, and this very likely was overwritten with old bookmarks from the backup. What's left to you now is to restore your profile (incl. bookmarks and open tabs) from a recent backup (manual or Time Machine): Close TenFourFox, then rename the "Firefox" folder in Application support to "Firefox (old)" or something like that, and put the Firefox folder from your backup into Application Support. several years) under the title of tenfourfox 24.6.
brought those bookmarks into tenfourfox. any folders or files for Firefox or tenfourfox in the Library folder. need Firefox present to run tenfourfox? for. What do you think? 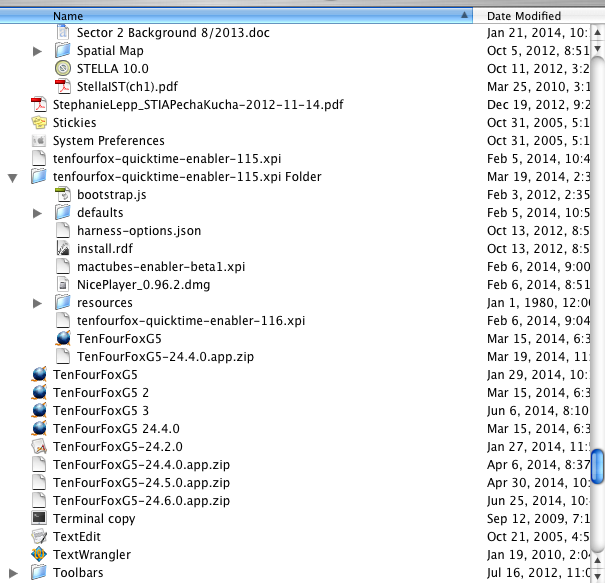 find any tenfourfox folder or files. Again, your help is appreciated. "it opened the actual Firefox app (which I haven't used in several years) under the title of tenfourfox 24.6." This is not possible. TenFourFox opens as TenFourFox, and Firefox opens as Firefox. But it doesn't matter now. We'll probably never know what exactly happened. "but I don't see any folders or files for Firefox or tenfourfox in the Library folder." Look in Macintosh HD/Users/[your user name]/Library/Application Support. "Do I need Firefox present to run tenfourfox?" No, that's not necessary. Moreover, I recommend deleting Firefox 3.6 from your system if you're certain you don't need it anymore. For the reason that it can corrupt your user profile if it's started accidentally. "Before I move anything" Please don't move anything. Rename the corrupted Firefox folder (see above) and then copy and paste the Firefox folder from your backup. "Also, while there's a Firefox folder in ~/applicationsupport, I don't find any tenfourfox folder or files." TFF is Firefox, as I said. There is only this one Firefox folder. It's used by both Firefox and TFF. What's in all those "bookmark....copy.html" files in Picture 1? Maybe the TFF bookmarks I'm looking for? Can I safely open those html files to view their contents? And have you looked at the places files I copied you on last post? I'd like to know what's in those. BTW: here's a snapshot of the TFF applications on my HD. Yesterday, when I decided to update to .6, I clicked on tenfourfoxG5 3.
version started—but it was titled tenfourfox. know what I did, and what I got. I'm sorry to be blunt, but this is going a bit too far. You have a known good backup, please use it as I advised. Replace the complete Firefox folder, not just parts of its contents because we still don't know what exactly was corrupted. I can't analyze your places. * files, there's no way for me to see if there's an error in them or how to repair it. You can safely open any html file with TenFourFox or any text editor, but as I said, the bookmarks the browser actuallly displays and works with are in places.sqlite. Regarding your Applications folder and the rest of your file system: Please have someone who knows Mac OS X look at it and clean it up, it's very much in disorder. If you use it like this, there's all sorts of problems on the horizon which may affect TFF but are impossible to troubleshoot remotely. I can't help you any further unless your file system is cleaned up. I've just replaced an hard drive that began to fail, It's out entirely. Now, with TenFour Fox 45.7.0, I can't save any bookmarks or import any from another browser other than safari. I run a Quicksilver G4, with a Western Digital 250 GB hard drive and a Sonnett dual 1.6 gig processor upgrade, been using this for years. I also have three additional 250 gig drives in the bus. 2] retain bookmarks that i choose to keep on a daily basis. Do you only want to import the bookmarks from the old HD or all of your old TenFourFox settings including bookmarks? Was not allowing any bookmarks to kept at all. Put it in again, rather on a external drive status, and it is reading just fine in the G4. Qto allow me to search for it. That only wants to import from Safari, and no other option is given. on *both* your new HD and the old HD before you begin. Quit TFF before you do the backup. 1) On the new HD, move said Firefox folder from Application Support to the Desktop. 2) Start TFF. It will create a new default Firefox profile folder. Quit TFF again. 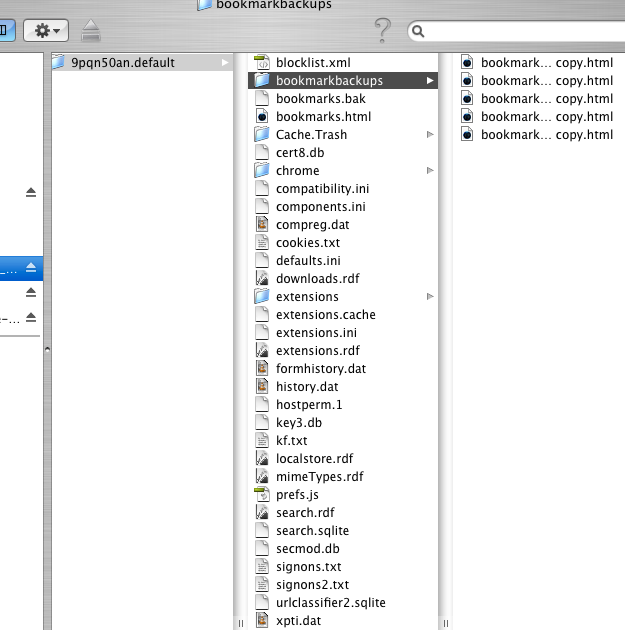 3) Copy (not move) the file 'places.sqlite' from the Firefox profile on the old HD to the Firefox profile on the new HD. The profiles inside the Firefox folders will have names like '7uikgfnl6n.Default' and the names will be different. The Places database is inside these profile folders. 4) Start TFF. You should see all your old bookmarks. Click Bookmarks>Show all bookmarks, then the Star button and Export Bookmarks to HTML. Save the resulting html file to the Desktop. Wait until the browser is done exporting, it may take several minutes (check the html file until it stops growing). 6) Now move the Firefox folder you previously moved to the Desktop back into Application Support on the new HD, replacing the one already present. 7) Start TFF. Click Bookmarks>Show all bookmarks, then the Star button and Import Bookmarks from HTML, choose your html export file on the Desktop. This will add your old bookmarks to the ones already present. Thanks, will attempt this later today! When I attempted this, I first made a copy to .pages to refer to while working. where I run aground is the making a backup copy for said files. I routinely used iBackup to make files, however used the organic apple program to archive tenfourfox, per instructions in the help section at top toolbar. I did not use my iBackup program to proceed. When I do this, a /zip file is created. When I open the zip file, a new tenfourfox is created showing only the icon. Haven't opened it further, as I didn't know what to do at that point. Can't see a seperate file to follow your further instructions to do something with. Have I stopped too soon? Or, have I performed a backup that is not what you intended? I read your instructions, and think I understand them. However, I think if I can get past the point where I run around [doing the backup], I will be successful. Need your point of view on how to do the backup you suggest. Thank you for your assistance, and patience! Please backup the Firefox folders in Application Support (on both HDs). You don't need to backup TenFourFox itself. Please explain how to use Application Support to copy the folders. I have never used this before. use my iBackup program to proceed. zip file, a new tenfourfox is created showing only the icon. I read your instructions, and think I understand them. around [doing the backup], I will be successful. Raymond, to be honest, on second thought it's probably better if you didn't attempt this. You need some more knowlege about the Finder, the folder structure in Mac OS X and the tools available to work with the file system. Maybe you know someone who can help you in person instead of in a forum? Please don't take this the wrong way, I want to prevent damage to your system. to me, for creating a file back up. I am running 10.4.11, if that assists. This is a forum for TenFourFox support, not general Mac support. Sadly, your issue cannot (to my knowlege) be solved from within the browser. The solution I proposed presumes the user has basic knowlege about file system operations and application data storage in Mac OS X, and I apologize that I didn't make this clear in the beginning. If you don't know your way around I cannot help you any further, this is too risky for remote forum support. You said: "If you don't know your way around I cannot help you any further, this is too risky for remote forum support." CHris, this is a not-so-nice way of saying that you are impatient with your assessment: that I am not the expert that you are, on computer programming. I suspect that if I had been on the phone with you for this problem, that you would have provided the solution, coached me on the "how-to" without delay. Instead, we are emailing and using that cyber-distance factor to remain incomplete on the issue at hand. I request that you hand this communication off to your superiors, in an a effort to support your customers, in an effort to satisfy customer's needs. Thank you for your support thus far, and I look forward to the actual solution to my problem, which seems to be a short conversation away still. I have received no further commo from Chris, nor any response from him as to my troubles. Ray, this support thread is officially ended. Chris has been more than patient with you, and going so far as to insult and demand telephone support from the unpaid volunteers of a free software project is unspeakably rude. This project does not have "customers." You didn't pay me, or him, for maintaining the browser, nor do you pay any member of this project for support, nor do you have to use this software. TenFourFox actually exists for one reason only: so that I had a browser I could use on my Power Macs. Since this is also useful to other people, I make it available and I'll fix issues that are reasonable for me to do so, and Chris generously volunteers his time to support users of it to facilitate that, but that's the extent of our support and you have exceeded it by far. I strongly suggest you find some other means of browsing the Web from your computer. Further posts you make here on any topic will be deleted unread. Cameron Kaiser closed this discussion on 10 Feb, 2017 06:44 PM.